In 1973 Sukhjinder became the Managing Director of KTC Edibles Ltd. in Wednesbury, when it employed 25 people with a turnover of 6.5 million. Today it supplies food ingredients globally, turning over in excess of 200 million and employing around 250 people. Through his business activities, Sukhjinder has made many commercial contacts within multi-cultural communities, giving him an insight into sensitive community issues. Sukhjinder fulfilled a four year term with Walsall North Birmingham Primary Care Trust, during which time the Trust faced a number of challenges. He was instrumental in the appraising and signing off of the new development of the Manor Hospital in Walsall. 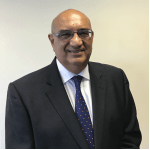 He was a Board member of Birmingham and Solihull Learning Skills Council, Board Director of Caldmore Housing Association and Chair of the Institute of Asian Businesses.